President Trump says a physical wall needs to be the main line of defense in the south. But a visit to several border towns in Texas shows that isn’t necessarily the case. Marcos Rios spent 10 hours on a cold Monday in February waiting for the start of Donald J. Trump's rally in El Paso, Texas. Holding a fluorescent green handwritten sign with the words "Trump Por Vida" -- or "Trump for Life" -- Rios was there to see the man in person and hear his plans for a border wall. He voted for the 45th president in 2016 and will again in 2020. Even so, he doesn't get Trump's wall. This is the first story in our Texas border trilogy, Tall Order: Building the Border Wall. Click here for the second story. "It might deter some people, but it's not going to work," says Rios, a 59-year-old school bus driver from El Paso. "They already have tunnels. If you wanna come here, you're gonna come here." Texas has become ground zero in the border wall war. Rios wants a solution to drug trafficking and illegal immigration but questions whether a physical barrier along the US-Mexico border is needed. He's not the only Texan who thinks so. While the state overwhelmingly voted for Trump in 2016 and thousands of people cheered the president on at the El Paso rally, interviews with Texans who'll have to live and deal with a concrete wall or steel barrier -- plus a mix of drones, high-tech cameras, sensors, license plate scanners and other digital surveillance systems -- say the wall may be a hard sell. Marcos Rios waited 10 hours to see President Donald Trump speak in El Paso, Texas. "We all want to have security in various ways and the border included," says John Ferguson, the mayor of Presidio, a border town east of El Paso. "But Trump's wall would make the United States a big, gated community." The president's El Paso rally was his first in 2019 -- and the first after a 35-day government shutdown over his request for $5.7 billion from US taxpayers to fund a border wall. Trump didn't pick El Paso for his latest wall pitch by accident. A high desert city of 685,000 people located on the western-most edge of Texas, El Paso is separated from Mexico by the narrow Rio Grande River. It's a major port of entry where immigrants have crossed into the US for decades. It's also where nearly four miles of a new 18-foot steel bollard wall was installed over the last six months. "You have thousands and thousands of people coming from Guatemala, from Honduras and El Salvador, and they march up through Mexico," Trump boomed into the microphone at the rally. "If we didn't have walls in those areas … in many cases where our great military helped us with barbed wire, you would have people pouring in." Trump's wall would make the United States a big, gated community. Fast-forward a month and Trump's wall proposal keeps feeding a political firestorm, even while data shows illegal immigration is at a historical low. Not only was the wall the cause of the government shutdown, but it also prompted lawsuits, protests and a constitutional dispute over what constitutes a national emergency. Last week, Trump, 72, asked for another $8.6 billion in wall funding in a federal budget proposal that was almost immediately dismissed by his critics. Yet, the president is determined to expand border walls. For the first time in his two-year tenure, Trump used his veto power to reject a congressional resolution that says there's no national emergency at the southern border. 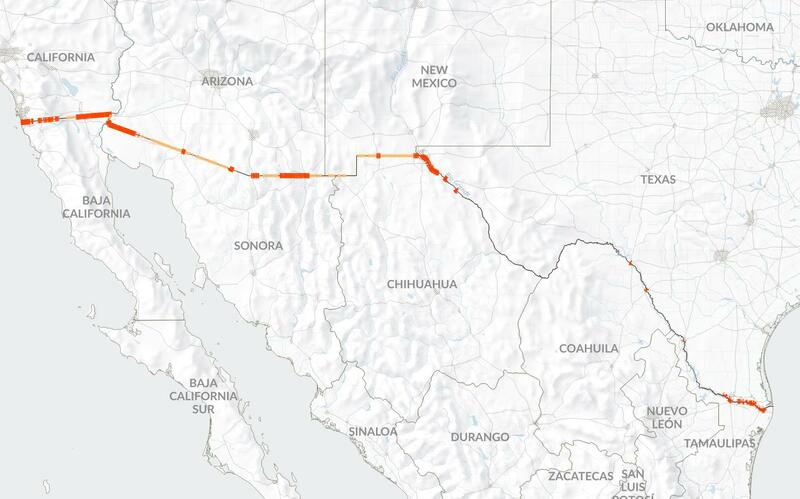 If all goes according to Trump's current plans, roughly 550 miles of wall will be built along the nearly 2,000-mile-long US-Mexico border as soon as possible. The majority of this construction is expected to happen in Texas. Unlike California, Arizona and New Mexico, which already have about 60 percent of fencing or walls at their borders, Texas only has around 20 percent because of its natural barrier with Mexico: the Rio Grande River. The slow-moving, silty-green river serves as the official southern border for the entire state. Starting in El Paso, it bends and winds through the mountains of the Chihuahuan Desert into Big Bend National Park's 1,500-foot-deep canyons, then through the grapefruit orchards and cotton crops of the Rio Grande Valley. Eventually, the river empties out through a sandy beach into the Gulf of Mexico. President Donald Trump's first rally after the longest government shutdown in US history was to tout his plans for a border wall. I set out to travel the length of the Texas-Mexico border, more than 1,200 miles, to find out how the wall -- and surveillance technology -- will affect those living along the river. Such a barrier is expected to drastically change the lives of hundreds of thousands of people. Local sheriffs and US Border Patrol agents say they've already been using technology to police the region for decades. And now, they're finding themselves in the middle of a major Silicon Valley-style shakeup. Despite Trump's insistence on a physical barrier, politicians throughout Texas are touting new technology as an alternative to physical walls. They're calling out everything from seismic sensors to lidar and fiber-optic cables as a partial solution for stopping drug cartels and stemming unwanted immigration. A "smart wall," they say, will be cheaper, more effective and do a better job of helping Border Patrol agents than a concrete or steel barrier. "We can't double down on a third-century approach to solve 21st century problems," Rep. Will Hurd, a Republican whose district covers more than 800 miles of the Texas-Mexico border, said in a statement. "It's time to harness American innovation." Presidio County is southeast of El Paso and smack in the middle of the Chihuahuan Desert, a nearly 140,000-square-mile expanse that stretches across the southwestern US and northern Mexico. Here, the high plains give way to hazy, yellowish mountains devoid of trees and full of cactus, rattlesnakes and rocky cliffs. Despite the empty, wind-swept feeling of Presidio County, it's a hotbed of high-tech border security initiatives. The federal government is pouring money into smart wall technology. The Department of Homeland Security earmarked $975.8 million for border tech in its 2018 budget proposal and $223 million in its 2019 budget proposal. The government already employs many of the same tools at the border the US military uses in war zones -- from tethered surveillance blimps called aerostats, that cost about $8.9 million each, to $16 million Predator B drones equipped with radar strong enough to detect footprints in the sand. The Department of Homeland Security is now in talks to fly smaller unmanned drones on nighttime border missions out of the Marfa Airport in Presidio County, according to Airports Director Chase Snodgrass. Called the RQ-7 Shadow, made by AAI Corporation, this drone uses an array of cameras, lasers and radars to "locate, recognize and identify targets" up to 75 miles away. It then beams that information back to a ground control station. The devices have been used in Iraq and Afghanistan. But to deploy the drones, the airport will have to close for hour-long blocks of time amid daily takeoffs and landings. That's rankled residents. "Let's just say I haven't had anybody local call me and say it was a great idea," Snodgrass says. "But I've had quite a few calling to say they don't like it." West Texas is deep within the Chihuahuan desert, known for its rocky cliffs and inhospitable terrain. Drones are just the beginning when it comes to high-tech border surveillance. The government is working with more than 30 tech companies to develop tools for national security. That's everything from lidar systems, which is the same laser light technology used in self-driving cars that measures the distance to a target, to machine-learning AI software to Bluetooth and Wi-Fi sensors that can measure a crowd's behavior and movement. Anduril may be the best-known of these companies. Its creator, Palmer Luckey, founded the virtual reality company Oculus that Facebook CEO Mark Zuckerberg bought for nearly $3 billion in 2014. Luckey left Facebook in 2017 after it was revealed he funded a pro-Trump group working to influence the 2016 election. Named after a magical sword in Lord of the Rings, Anduril says its goal is to be the future of defense. Using a system it calls Lattice, the company can process inputs from hundreds of thousands of sensors strategically placed along the border -- including 20-megapixel visual cameras, thermal cameras and radar -- and then use artificial intelligence to instantaneously interpret that data. For example, Lattice can continuously monitor one stretch of desert and the moment it detects anything out of the ordinary, like a vehicle pulling over or a group of people walking, Border Patrol will be alerted. We can't look at defending our border in a static way, because the threat is dynamic. Anduril has a contract with US Customs and Border Protection in California and is testing its tech on a private ranch in West Texas. The rancher had cartel traffic crossing his land, the company says, so he let Anduril give Lattice a whirl. In the first few months, the system led to the capture of 39 migrants crossing the border, along with 16 drug smugglers carrying 982 pounds of marijuana, according to a report by Wired. Anduril says this rancher no longer has problems with cartel traffic because the system now works as a deterrent. The company confirmed these details but declined to comment further. When Hurd talks about a smart wall, it's tech like Anduril's he envisions. He sees the digital barrier beaming real-time info to Border Patrol agents' smartphones about every drug trafficker and human smuggler who crosses the international boundary. "We always have to remember the enemy adapts," says Hurd, a former CIA officer who now sits on the House Intelligence Committee. "That's why we can't look at defending our border in a static way, because the threat is dynamic." US-Mexico border crossings, like this bridge between El Paso, Texas, and Juarez, Mexico, tend to be high security zones. It's hard to escape the impression the border is being militarized, which is why groups like the American Civil Liberties Union warn that smart wall tech could have serious privacy implications. The ACLU says allowing the Department of Homeland Security "to track, surveil and monitor individuals indiscriminately and with precise detail" could lead to intrusions on the most intimate aspects of Americans' lives. But Hurd and the Silicon Valley companies working on border security say a smart wall is fundamental to protecting the border. Even so, it's unlikely that will sway the president. "They can have all the drones they want flying up in the air and spinning around, and all the technology in the world. It's all -- I call it 'bells and whistles,'" Trump said during a Christmas video teleconference. "But if you don't have the wall, it doesn't work." Curious what locals think about Trump's wall, I head to the dusty little border town of Presidio -- the only place to legally cross between the US and Mexico for hundreds of miles. About 4,000 people live here, mostly in single-story homes where dogs bark from behind chain-link fences. This is the land of pickup trucks and red enchiladas. Mayor Ferguson, a friendly, soft-spoken 55-year-old with thick brown hair full of cowlicks, offers to be my tour guide. He's been the mayor on and off for about nine years and has worked in local public schools most of his adult life. We start by walking over the international bridge. A few elderly women with shopping bags and young men on bicycles make their way back and forth between the US and Mexico, but it's mostly empty. Down below, the Rio Grande cuts between Presidio and its sister city, Ojinaga. The river is narrow enough here that you can throw a rock and hit the other side. The majority of the Texas-Mexico border doesn't have walls or fences. Here, just south of Presidio, the Rio Grande serves as the official border between Mexico (left) and the US (right). "What you'll find along the Texas border is people who've lived here forever," Ferguson explains. "Most of the water you see is coming out of Mexico. A lot of people use that water." I ask him where the wall would go if Trump's plans fall into place. He sighs deeply and just says, "Yeah…"
"It's not so simple that you're going to build this big wall," he adds. "If we were to build a wall, we'd lose our own river." The idea of a border wall long predates President Trump. The US has been putting up barriers along its southern border for the last century. After President Bill Clinton signed the North American Free Trade Agreement in 1994, 18 miles of wall were added. After 9/11, President George W. Bush spearheaded plans for an additional 523 miles, much of which was built during President Barack Obama's tenure. Today, 654 miles of the 1,954-mile US-Mexico border -- about a third of the distance -- has some sort of wall or fencing. The areas without any wall tend to have natural barriers, like mountains or the Rio Grande. So far, no new miles of Trump's proposed 18-to-30 foot wall have been constructed. But at least 40 miles of replacement wall -- like the new steel barrier in El Paso -- have been added. A plaque on the international bridge between El Paso, Texas, and Juarez, Mexico, represents the border between the two countries. Keeping up with the daily back-and-forth of whether a wall will be built is dizzying. To recap what's been going on the past several weeks: Congress passed a spending measure in mid-February to avoid another government shutdown. Trump signed the measure, which would pay $1.375 billion for 55 miles of steel fencing, but he was unhappy with the deal. So the following day he announced an unprecedented national emergency that would allow him to tap into more than $6 billion additional funds to build the wall. The money would be diverted from other government reserves, like a military construction fund and a military antidrug account. Within days of Trump's declaration, lawsuits were filed challenging his use of emergency powers. One of those suits was brought by a coalition of 16 US states. In the suits, lawyers cited Trump's own announcement on the national emergency. "I could do the wall over a longer period of time," Trump said. "I didn't need to do this. But I'd rather do it much faster." On March 14, Congress passed a resolution to terminate the president's national emergency. One day later, Trump vetoed that resolution. The legislation now heads back to Congress where the resolution's supporters need to get enough votes to override the president's veto. If we were to build a wall, we'd lose our own river. While it's unclear how Washington's battle will shake out, a lot of people in Texas are left scratching their heads. "Here we stand at the international border, and there's no wall and there's no people crossing the river," Ferguson says, looking down at the water below. "You'd think if there was an emergency going on there'd be all sorts of people here to apprehend. But there's not." In Brewster County, just south of Presidio, I meet with the local sheriff. Brewster County is cowboy country. Known for vast cattle ranches and tabletop mesas, it's the biggest county in Texas -- almost equal in size to Connecticut. It's also the most rural with just 9,000 residents. Frigid winds blow across its inhospitable landscape throughout the winter, and scorching desert sun cracks its earth in the summer. Surviving out here is no easy feat. Locals say an unspoken policy is to leave your home unlocked so traveling migrants can go in, get water and not break the windows. Brewster County Sheriff Ronny Dodson is in charge of the biggest border county along the US-Mexico border. Sheriff Ronny Dodson's office is in a quaint red-brick building that used to be the county jail. He looks the part of a Texan sheriff: tall, with broad shoulders, a cowboy hat and a woven leather gun holster. Dodson's family has been in Brewster Country for six generations stretching back before the Mexican Revolution. Pancho Villa's rebel group once famously raided his great grandfather's ranch, forcing his family into hiding. While the Border Patrol's job is to catch people entering the US illegally, a lot of that work also falls under Dodson's jurisdiction. That's because Brewster County, with its 192 border miles, has more border territory than any other county in the US. "The president is going to El Paso and he went to McAllen, those are big places," Dodson says, taking off his cowboy hat to smooth down his hair. "It's different out here." He regularly catches small groups of people walking through the desert with more than 100-pound backpacks of drugs -- marijuana being the main drug he finds. He also apprehends immigrants coming to the US. But, he says, they're not pouring in. "This country has a hunger for cheap labor and a hunger for narcotics," Dodson says. "As long as we have that hunger, they're coming." "This country has a hunger for cheap labor and a hunger for narcotics. As long as we have that hunger, they're coming. He takes out his smartphone to show me photos from hidden cameras that he set up along the border. One photo shows six or seven people in dark blue hoodies huddled behind a mound of dirt. He tells me they are migrants planning to cross the border. "They didn't know the camera was there taking pictures of them," Dodson says. "The tech we have now lets us see everything." To prove his point, he shows me other photos he caught of wild animals, including mountain lions, gray foxes and even Mexican black bears. Along with cameras, Dodson uses handheld drones and buried seismic ground sensors to augment his work. But, unlike federal security agencies, he says state and local law enforcement is limited with how much tech it can use because of lack of funding. "We see guys come to our conferences and they set up these magnificent cameras," Dodson says, but these cameras cost $500,000. "There's no way we could afford half a million dollars, not in this county." Brewster County's border is full of natural barriers, including Santa Elena Canyon and its towering cliff walls and the deadly Chihuahuan Desert. A border wall can be practical in places like El Paso and McAllen, Dodson says, but it doesn't make a lot of sense out here. Anti-wall protest banners can be seen throughout West Texas. Before the sheriff shows me one last photo on his phone, he asks, "Do you have a strong stomach?" He pulls up a picture of a dead migrant that he and his deputies were called to handle last summer. The man is lying in the dirt among the cactus. He isn't wearing a shirt and his bloated body is burned completely black. His face and hands have been eaten away, presumably by insects and animals. Dodson told me it was 120 degrees on the day he found the man. "They tear off their clothes when they're dying of thirst, because they think it'll help," Dodson says. "It's pretty terrible what happens to some of these guys." Driving through the desolate desert landscape, I see in the distance a roadblock constructed of orange cones leading to a small green-and-white building. Border Patrol agents wearing army-green uniforms signal me to slow down and stop. "Where are you coming from," an agent asks, shining his flashlight into the back seat and trunk of my rental car. "Are you an American citizen?" These checkpoints are all along border highways, and every car coming through is required to stop. A bevy of cameras and sensors usually takes images of people's vehicles, including their license plates. The agents are accompanied by dogs trained to detect drugs. A simple cross on Texas State Highway 17. They wave me on after I answer their questions. I'm headed to the central region of the Texas-Mexico border to catch a nighttime ride with Border Patrol agents and see firsthand how Central American asylum seekers are faring after caravanning across Mexico. With the barren yellow-hued mountains receding in my rearview mirror, I think back to the Trump rally in El Paso. As the president's speech continued into the night, the crowd seemed to lose energy and people began to trickle out of the coliseum. When Trump finally finished after an hour and 20 minutes, he slowly made his way offstage waving, clapping and mouthing "thank you." Music rose over the loudspeakers and, as if on cue, the song was the Rolling Stones' You Can't Always Get What You Want. In West Texas, that sentiment might come true. Tall Order: Building the Border Wall is our Texas border series exploring what a wall and tech alternatives might mean to the people, communities and law enforcement agencies living in its shadow. Read the second story here: At Texas border, tech can't keep pace with immigrant influx. And stay tuned for the third article, "Surveillance State and Lost Treasures." Correction, 3:23 p.m.: Fixes formal title of US Customs and Border Protection.